Since their meteoric launch on Kickstarter in 2014, our new-generation high-performance Australian-made AUSfonte cookware has been widely acclaimed by expert cooks; in strong demand at gourmet retail in Australia (#1 selling cookware on Australia's biggest kitchenware site, KitchenwareDirect), exported to the USA and soon to the UK. Why so popular, so quickly? Full 30cm (12") cooking surface diameter. Thin walls with reinforcing ribs to reduce weight and increase strength. Matching pair: fits 32cm DEEPan as a lid for casserole, or as a base for dutch oven format. Big 7 Litre (7 Quart) capacity. Wide but not too deep: can be used as a regular pan for frying and browning, then covered for braising and slow cooking. Thin walls with vertical reinforcing ribs to reduce weight and increase strength and horizontal heat-capturing ribs. Matching pair: fits 32cm BIGskillet as a base for casserole, or as a lid for dutch oven format. Converts regular flat pans into cast iron grills, for outdoor grilling, or indoors in any weather. No need to buy and store a separate grill pan: switch between flat pan and grill pan in seconds. Small 18cm Pan Grill-it fits AUSfonte 24cm Sauteuse pan base, and Large 30cm Pan Grill-it fits in BIGskillet base. Also works in any pan of suitable diameter and resistance to the high heat required of real grilling/searing. Seasoned cast iron is best and easiest to clean (natural and safe high temp nonstick seasoning), but works in stainless steel, ceramic or enamel. 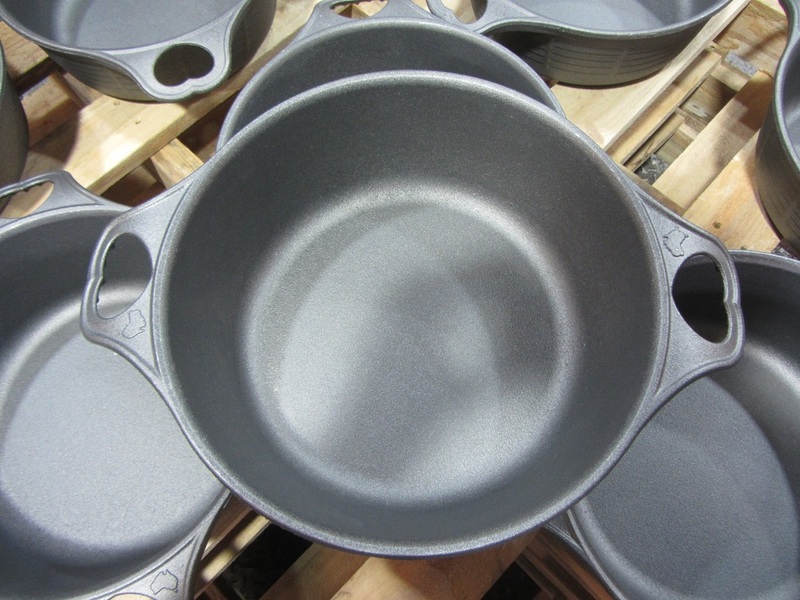 Not suitable for synthetic-coated pans due to their toxic by-products at high temperature. NEW TO CAST IRON, OR NEW TO AUSTRALIAN CAST IRON? Bare seasoned cast iron is very different to synthetic-coated nonstick aluminium, different to enamelled cast iron, and everything else. Yes it takes a little learning and maintenance, but quickly you will find naturally that you want to cook almost everything in your cast iron pan. Just like the experts. 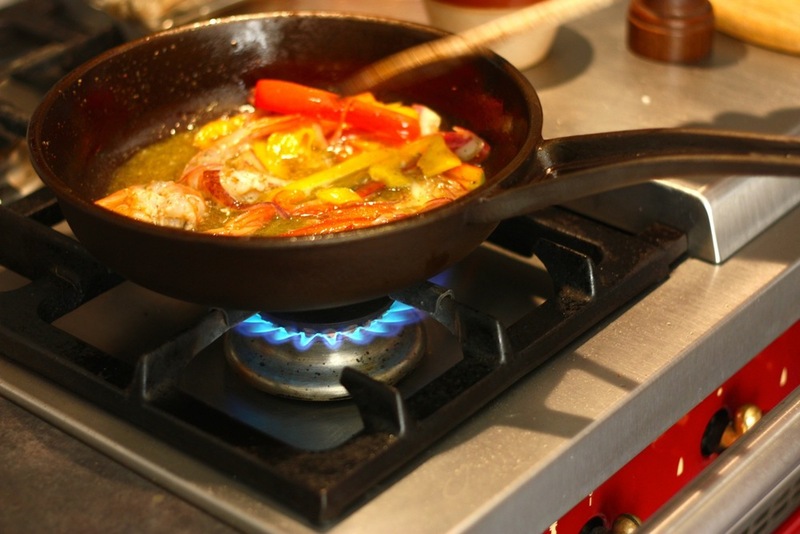 Cast iron cookware has been with us for thousands of years….since the dawn of the Iron Age. But what about the modern health-conscious and environmentally-conscious cook? There's been a big surge in popularity of cast iron in the USA in the last 5 years or so, partly because bare seasoned cast iron cooks everything so well, with even heating and best browning, multi-generation durability, healthy natural non-stick and corrosion-resistance without synthetic coatings, and much more. 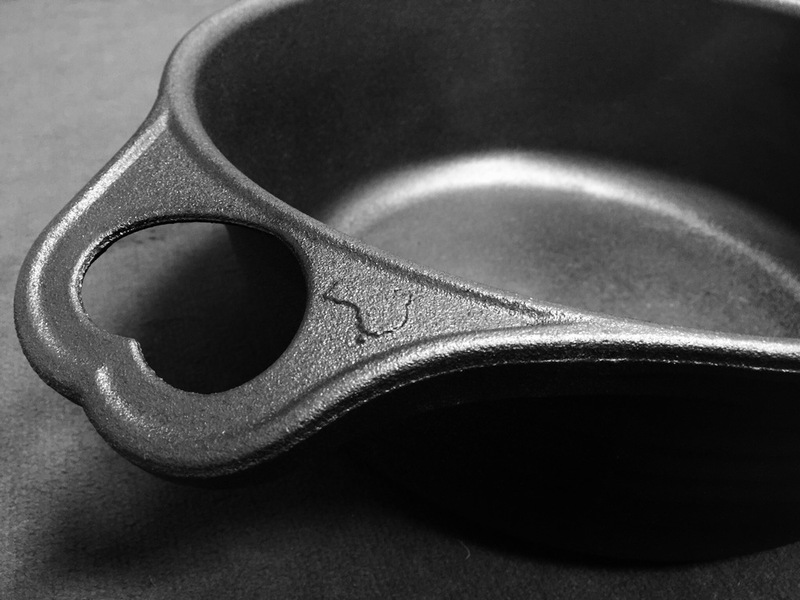 The health and cooking performance benefits of natural cast iron justify a little extra maintenance upfront. And it’s easy….once you know how. The same cast iron pan: bare, unseasoned iron after casting (left), and well-seasoned (right). We've put a few of our favourites here http://www.solidteknics.com/recipes, and many more great cast iron recipes can be found searching online. 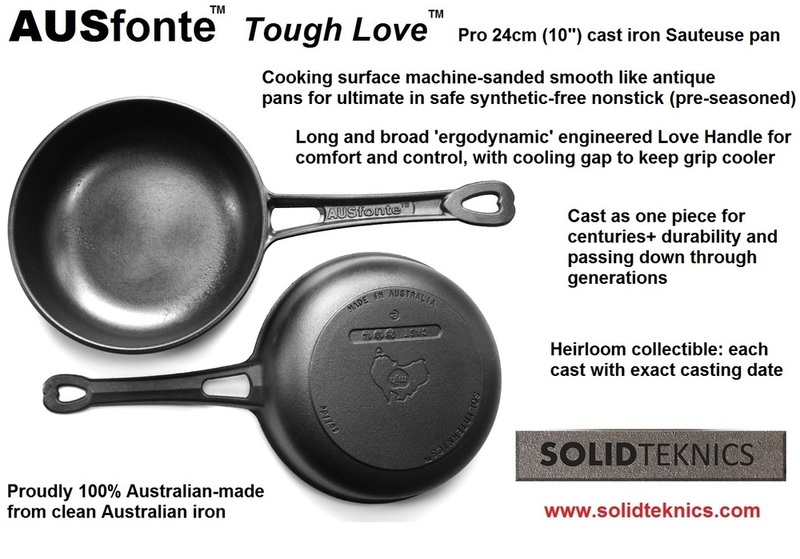 ”Don't buy AUSfonte Tough Love pans as just a technically great product to last your whole lifetime. 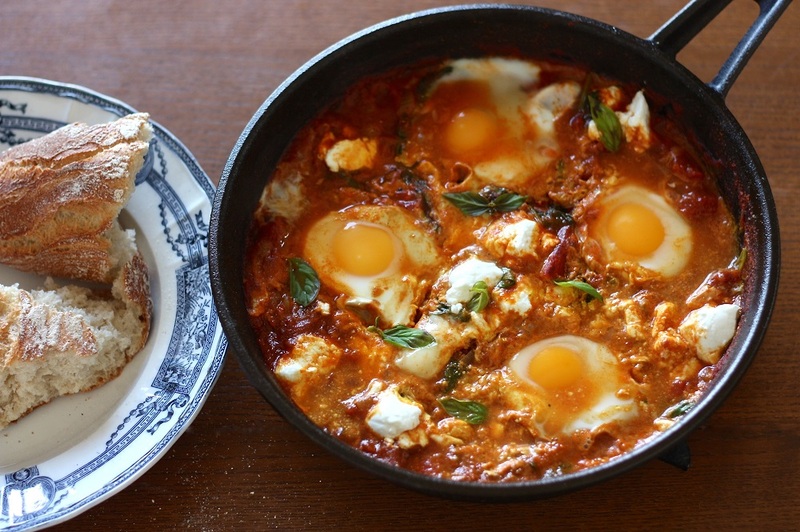 Invest in them as a family heirloom and spread the love down through many generations of shared cooking history." We reserve the same rights for the 'Pan Grill-it' trademark, worldwide, except for within the United States of America (Where Pan Grill-it USA maintains those rights).